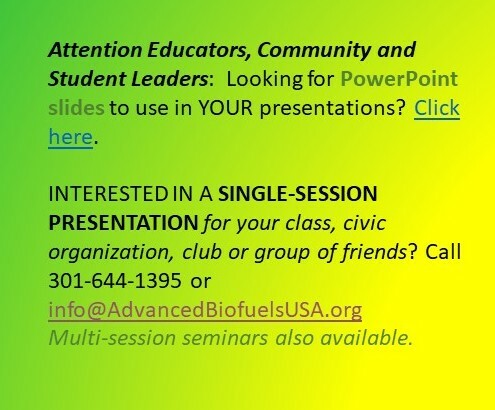 by Robert Kozak (Advanced Biofuels USA) US domestic oil production cannot bring energy independence alone; renewable transportation fuels are contributing and must increase their contribution in order to achieve that policy goal. From the pronouncements of President Obama to reports in the mainstream media one would think that the US is producing oil at record levels, oil imports are not required, and we will be “energy independent” for a long time from only new domestic petroleum reserves. Are those claims based on sound information? We went to the newest US Energy Information Agency data we could find to verify these claims. The available data tells a very different story. 1. Is Current US Oil Production at Peak Levels? No. It isn’t even close. 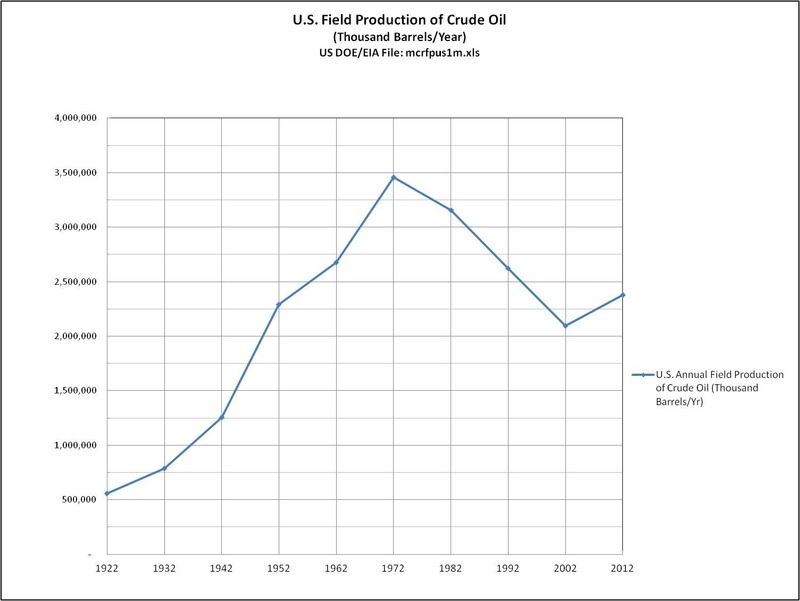 We compared yearly crude oil production for the past 90 years. As shown in this table, annual production in 2012 (the latest yearly total) is about 69% of the peak reached in the early 1970s. In fact, current production is about the same as it was in the late 1950s. 2. 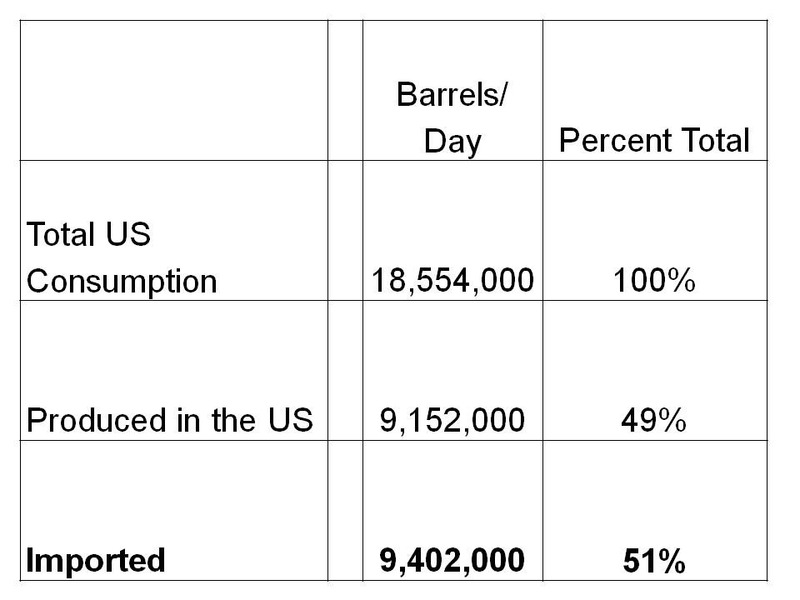 Is Most of the Oil Consumed by the US Produced in the US? Again, No. Despite reports that the US is a net exporter of hydrocarbons (which includes coal) and has increased shale oil production, in 2012 the United States still imported 51% of its daily oil consumption. This imported oil quantity would have been even higher if the approximate 900,000 barrels/day of ethanol in E10 were not available, if new cars and light duty trucks entering service were not getting substantially better mileage, or if the millions of people unemployed or underemployed were driving to work regularly. 3. Does Most of the Oil Imported to the US Come from Middle Eastern Countries? While many public campaigns for increased domestic oil production use the fear of Middle East turmoil as a rallying cry, it turns out that US oil imports come from a variety of different regions. 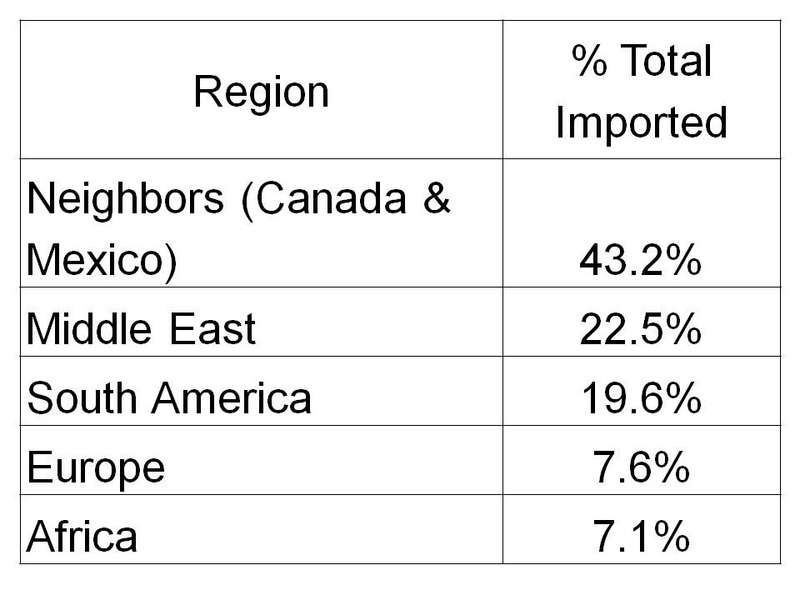 As this table, based on US DOE/EIA 2012 data shows, the three major sources are our immediate neighbors (Canada & Mexico), the Middle East and South America. And somewhat surprisingly, the US also imports slightly more oil from Europe (including Russia) than it does from Africa. What this data says is that the geostrategic issues and national defense costs associated with US oil imports actually are more complex and costly than those just related to the Middle East. 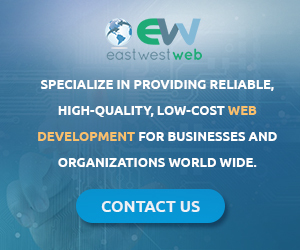 So, while a having variety of sources may seem to be an advantage, when dealing with a vanishing, high value resource such as oil they can also bring a variety of costly problems. 4. Does the US Have a Long-Term Oil Supply? Not if long term means more than 7-15 years. On 1 August 2012, EIA released a report that upgraded US oil “Proved Reserves” by 12.8% over 2010 values to 25.2 billion barrels. While much commodity speculation is done on the basis of “Unproved Reserves,” the only number that really gives you a baseline for the future is Proved Reserves. 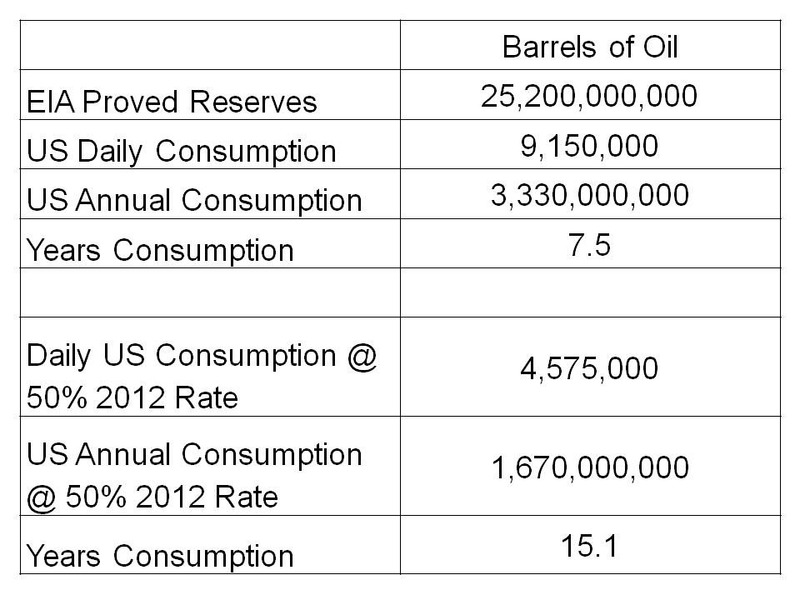 While 25.2 billion barrels sounds like a lot, how many years of US oil consumption does that translate into? About 7.5 years at our current rate of consumption. 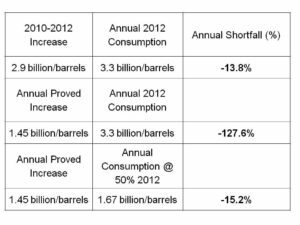 In the following table, the EIA Proved Reserve value was divided by the current US daily oil consumption rate of 9.15 barrels/day and also by a future “High Conservation Scenario” that cut US oil consumption by half. Even with that level of conservation, the Proved Reserves would only last 15 years. 5. Could Future Proved Reserve Increases of the Quantity Identified in the 2012 Report Meet Future Needs? The increase of Proved Reserves by 12.8% from 2010 to 2012 was understood by many to indicate that things are not that bad. The argument made was, if the US kept increasing their Proved Reserves by the quantity presented in the 2012 report then medium, and possibly long term, needs could be met. Was there validity in that argument? Not really. 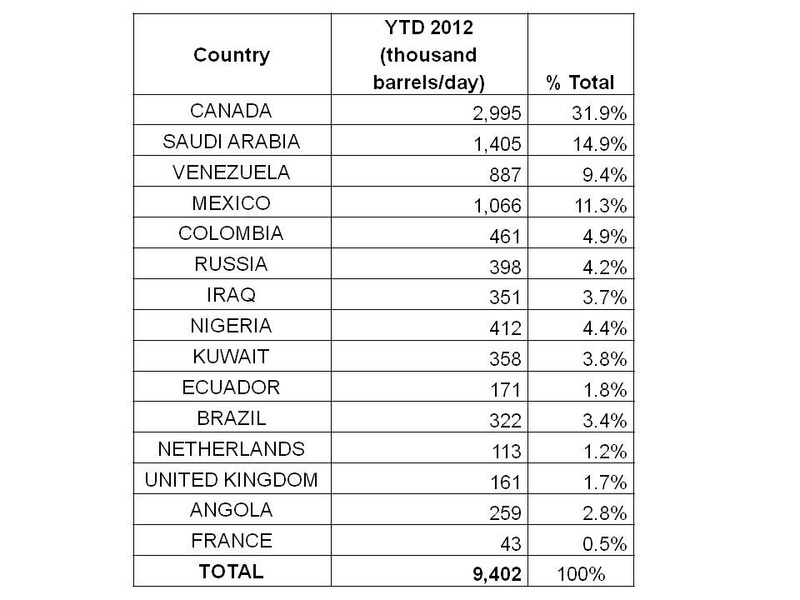 The 12.8% increase in Proved Reserves translates into 2.9 billion barrels. Unfortunately, this is less than the current annual US consumption rate of about 3.3 billion barrels/year. 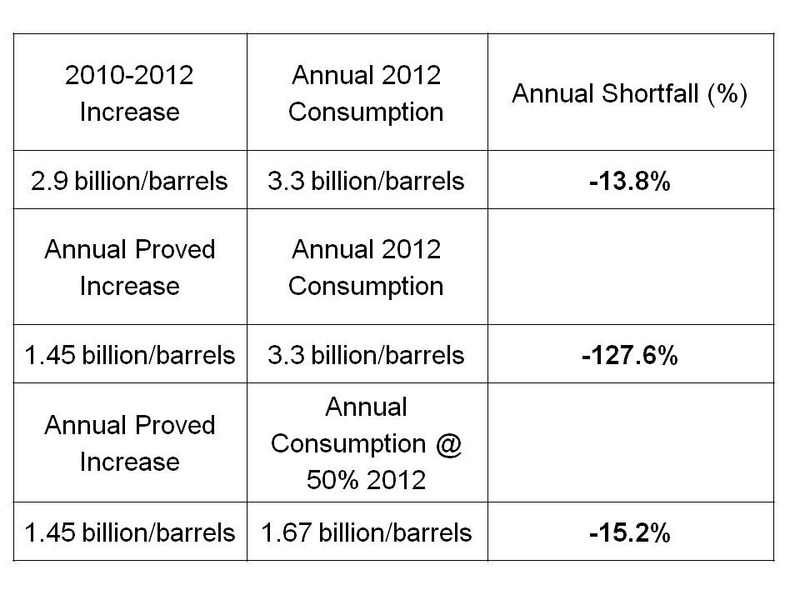 Furthermore, that 12.8% increase was over two years, so the annual increase rate was 6.4% or 1.45 billion barrels. As the following table shows, even if the 50% oil consumption goal was met, the 12.8% increase of Proved Reserves would still not meet annual demand. 6. What Does This All Mean? 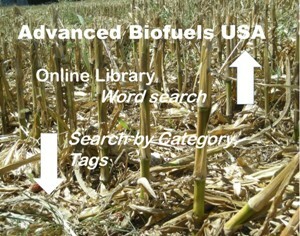 Could Renewable Fuels Substantially Contribute? The data presented above makes a clear case that the United States does not have a sustainable supply of liquid transportation fuels. Despite the hoopla surrounding horizontal and deep sea drilling, all the investment in the world is not going to make much of a difference. The supply of US liquid fuels is running low. 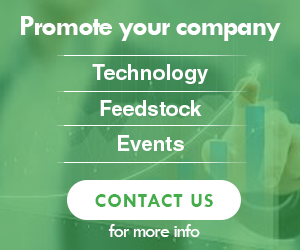 Therefore, it would seem logical that US energy decision makers accept this reality and instead take another look at revitalizing funding for the development of a renewable fuel industry based on non-food sustainable biomass sources. Such an industry could not only meet the Proved Reserves shortfalls identified in Table 5, but as studies including the USDA “Billion Tons” report have shown, renewables could provide over 50% of the country’s oil needs.